In 1908, Gazelle, the famous Dutch bicycle company, commissioned Haarlem artist Ko Doncker (1874 – 1917) to create a picture book. 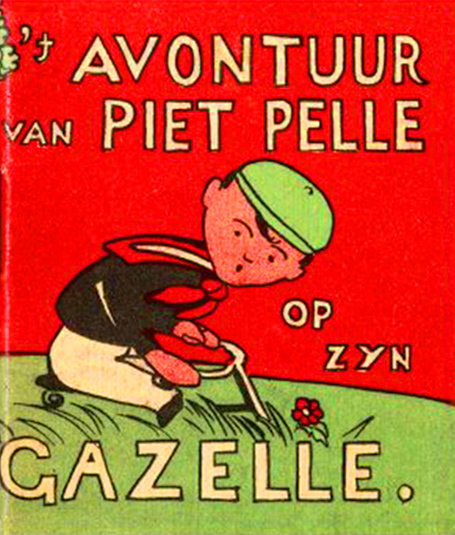 Doncker soon presented The Adventures of Piet Pelle on his Gazelle, “a fascinating story for children aged 8 to 80 years,” and “an artistic picture book for children from 8 to 80”. The booklets were promotional material for Gazelle’s Piet Pellethane (youth) bicycles. The booklet features forty illustrations portraying the far-fetched adventures, with the accompanying text written in rhyme. The illustrations were printed in three colors: green, red and black. The story is regarded as the oldest and longest-running Dutch comic strip. 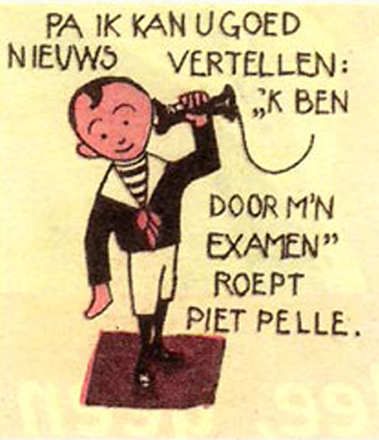 The booklet’s first printing ran to twenty thousand copies, making Piet Pelle a famous character across the country. The Algemene Nederlandse Wielrijdersbond association magazine and the student magazine Propria Curus both praised the book and the Piet Pelle character. The second printing ran to five thousand copies. In 1913, Gazelle had posters printed that featured a Piet Pelle motif, which they distributed to dealers for them to hang in their shops. New editions of Piet Pelle were released annually from 1923 until the Second World War. The third edition of the book, published in 1924, was printed by Friedrich Robert Emanuel Baensch in Magdeburg. The print run of this edition went to 175,000. They were delivered to Gazelle for 32.50 guilders per one thousand copies. There were also 250,000 new posters printed in 1924. Graphic artist André Vlaanderen worked on the Pelle materials until 1953. Two Piet Pelle films were made between 1928 and 1930, which dealers showed in their shop windows. They sometimes attracted such crowds that the demonstrations had to be limited. One of them was a six-minute cartoon made by Theo Güsten in 1930, in which Piet treks by bicycle and airship to the North Pole to set up a radio transmitter. (Some Piet Pelle films are accessible on YouTube.) During the 1950s, a Groningen Gazelle dealer was prohibited to roll the films due to the large groups of street-clogging spectators which the showings would draw. Piet Pelle was updated in 1960, with the steam locomotive replaced by an electric engine, the wall phone by a modern telephone, and Piet’s father’s coat by a newly-fashionable garment. The language of the text was also adapted to fit with modern idioms and customs, and the book was printed and bound into a more economical format. In the early 1960s, Kees Stip wrote two new Pelle stories, with artwork by Guus Boissevain (1929 – 2008), a Dutch cartoonist, illustrator and painter (and father of actor Daniel Boissevain). Boissevain sometimes worked under the pseudonym ‘Gub’. The stories – Piet Pelle’s Journey Through the Universe (1963) and Piet Pelle, the Tortoise and the Hare (1964) – did not become as popular as the original by Ko Doncker. More Piet Pelle action occurred in this period when in August 1963 Gazelle instigated an advertising campaign which involved an aircraft flying along the Dutch coast. When it appeared that a man had fallen into the sea, the coast guard was alerted and rushed to the scene. What they discovered was a large, nylon figure of Piet Pelle bobbing in the water! In his 1992 book Pijn is genot (Pain is Pleasure), author Jan Siebelink recounted how at nine years old, he ran to a local bicycle shop early one morning in order to receive a free copy of Piet Pelle. Siebelink arrived first, and soon a long line formed behind him. Piet Pelle was the official mascot of Gazelle until 1998, with the slogan Doe als Piet Pelle – kies ’n Gazelle (Do as Piet Pelle – choose a Gazelle). Piet Pelle was put to work again in Het nieuwe fietsplan (The New Bicycle Plan), Gazelle’s advertising campaign for its electric bicycles, in 2015. A short film, De avonturen van Piet Pelle en zijn elektrieke Gazelle (The Adventures of Piet Pelle and his Electric Gazelle) was released that year. The character has achieved cult status in The Netherlands, with the Piet Pelle motif appearing on T-shirts, mugs and other products. There is also an active collector’s market for original Gazelle Piet Pelle materials. In 1997, a Piet Pelle statue was unveiled in Dieren. Born on April 6th 1874 in Haarlem, Doncker was an author, illustrator and shadow play artist. He was the son of a rye bread baker. His father wanted him to carry on in the family business, but Doncker was determined to follow his artistic ambitions. Doncker attended the School voor Kunstnijverheid (School of Applied Arts) in Haarlem from 1888-93. He then toured Europe by bicycle and lived in London, Paris and Belgium between 1894 and 1905. During this period, he made his living as a stage designer and cartoonist. He painted scenery for the 1894 Universal Exposition of Antwerp and designed decorations for the 1897 Brussels World Exhibition. 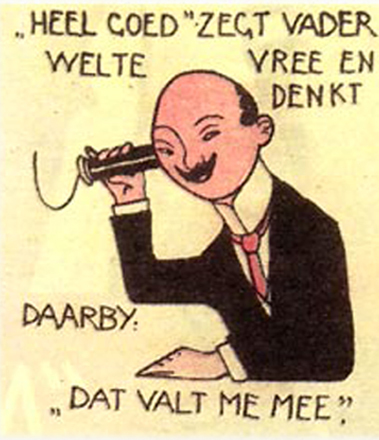 In 1900, he had his De Avonturen van Dr. Mol (The Adventures of Dr. Mole) stories published. When his father died in 1906, Doncker went home to handle the affairs of the family business, keeping his painting and drawing instruments in a back room of the bakery. After another journey, he settled in Haarlem as a recluse, working as a cartoonist for the satirical De Ware Jacob, the Haarlem Dagblad, and the Groene Amsterdammer newspapers. Doncker especially liked working on shadow plays. He also did drawings for advertisers, creating characters for flower shops, the cigar maker Salm and others. In 1911, Doncker introduced the limerick to The Netherlands. He eventually devoted himself entirely to the shadow play, both writing and creating the pieces for them. Doncker suffered from kidney disease, and while riding a bicycle on April 7th 1917, he fainted and fell from the saddle. He died of a heart attack on the way to hospital, aged forty-three. An obituary in Elsevier’s Geïllustreerd Maandschrift magazine likened Doncker’s humour to that of Wilhelm Busch. It described Doncker as a natural, childlike man who lacked vanity. Kees Stip (1913 – 2001) was an epigram poet. He studied classical languages at the Rijksuniversiteit Utrecht and was a member of the Unitas student association where he met Leo Vroman, Albert Alberts and Anton Koolhaas. In the postwar years, Stip worked as a copywriter for the press agencies of the Dutch government and Dutch Army. Later, Stip was editor at the Polygoon cinema newsreel. Stip wrote under the pen name ‘Trijntje Fop’ from 1951, composing animal poems for de Volkskrant (a Dutch newspaper) and for magazines. He also used the pseudonym ‘Chronos’. Lachen in een leeuw (Laughing in a Lion), the complete poems of Stip, was published in 1993. Established in 1892 by Willem Kölling, a Dieren postal manager, Gazelle began as a small-scale importer of English-made bicycles for the Dutch market. Kölling hit on the name ‘Gazelle’ while witnessing a roebuck gliding through the woods around Laag Soeren and Dieren, prompting him to manufacture bicycles named after one of the swiftest members of the antelope family. Kölling partnered with ironmonger Rudolf Arentsen, and production of Gazelle bicycles commenced in 1902. After a 1912 expansion, Gazelle grew over the next twenty-five years, mushrooming from a two-man concern into an international company which exported bicycles to the East Indies. Innovations in the 1930s included tandem, folding and electric bikes. Gazelle recovered quickly after the occupation during the Second World War, growing through the 1950s and 1960s. Gazelle marked the production of its one-millionth bicycle in 1954, and presented its ingenious Kwikstep folding bicycle in 1964. The 1970s and 1980s brought changes of ownership, and Gazelle received its royal title from Princess Margriet – creating the name Royal Dutch Gazelle – on the occasion of the company’s centenary in 1992. Gazelle completed its eight-millionth bicycle in this year. In the 2000s Gazelle’s ownership changed hands again and growth continued, with 2008 marking thirteen million bikes manufactured. King Willem-Alexander opened a new Gazelle factory on the Dieren site on September 3rd 2015. Gazelle’s workforce of about 550 turns out more than 350,000 bicycles annually. In 2017, Royal Dutch Gazelle celebrates 125 years in business. You can read more about the company in our May/June 2017 issue.